We manufacture and supply Double Mast Aerial Work Platform that is made as per the industrial standards by utilizing well-tested resources. The Double Mast Aerial Work Platform, offered by us, allows one or two people to work on a height with ease and that too with ample of weight. 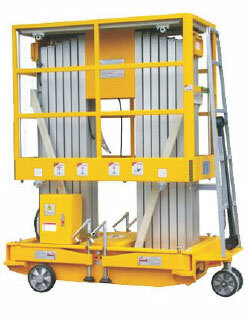 Suit for 1-2 people to work upraised With 300KG rated capacity. Maximum platform height (optional): 6m;8m;10m;12m; 14m. Buttons inside of the controlling box are imported from U.S.A.